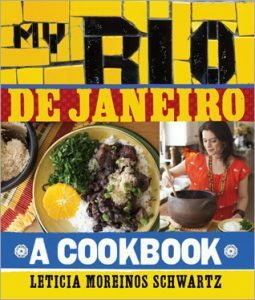 RIO DE JANEIRO, BRAZIL – For those looking to recreate the tastes of Rio’s restaurants in their own kitchens, author and chef Leticia Moreinos Schwartz offers up easy to follow recipes in English with her recently released second book, “My Rio de Janeiro: A Cookbook”. Author and chef Leticia Moreinos Schwartz recently released a second book full of mouth-watering Brazilian food recipes, press image. In her first cookbook, “The Brazilian Kitchen: 100 Classic and Creative Recipes for the Home Cook,” Chef Leticia, as she is known, shared delicious recipes for traditional Brazilian dishes. In her second book, “The Carioca,” she takes readers on a culinary tour of her home, delivering recipes from and inspired by restaurants throughout the area. In a little under two hundred pages, the Rio-born chef who moved to New York city in 1997, teaches readers, with simple and easy-to-follow instructions and photos, how to cook approximately ninety Brazilian meals at home, wherever in the world that home might be. The featured recipes include: Risole De Camarão com Catupiry (Shrimp and Catupiry cheese Turnover) inspired by the dish served by the iconic bar, Jobi in Leblon; Filet Oswaldo Aranha inspired by the cuisine found in and around the city’s Jardim Botânico neighborhood; a Farfalle with Salmon and Caipirinha Sauce dish from the city of Búzios. Chef Leticia was born in Rio but currently resides in the U.S. There, she writes about foods, teaches hands-on cooking classes, and provides food styling, food testing, as well as catering services. She has also appeared on a series of American television shows, including “The Today Show“, “CBS New York“, and is a regular guest on WTNH, broadcast from New Haven, Connecticut, U.S.
For those interested in bringing Rio into their kitchens, “My Rio de Janeiro: A Cookbook” is currently available at Amazon.com, Barnes & Noble, and Indiebound.org. Autographed copies are also available for purchase by contacting leticia@chefleticia.com. Get a few recipes and read more here.